For other uses, see Yat (disambiguation). Not to be confused with Semisoft sign. Cyrillic letter yat, set in several fonts. Note that in cursive writing, the small yat has a considerably different shape. Yat or jat (Ѣ ѣ; italics: Ѣ ѣ) is the thirty-second letter of the old Cyrillic alphabet, as well as the name of the sound it represented. Its name in Old Church Slavonic is jět’ (ѣть) or iat’ (ꙗть). In the common scientific Latin transliteration for old Slavic languages, the letter is represented by e with caron: ě (taken from the Czech alphabet). There is also another version of Yat, the iotified Yat (majuscule: ⟨Ꙓ⟩, minuscule: ⟨ꙓ⟩), which is a Cyrillic character combining a Decimal I and a Yat. There was no numerical value for this letter and it was not in the Glagolitic alphabet. It was encoded in Unicode 5.1 at positions U+A652, and U+A653. Yat represented a Common Slavic long vowel. It is generally believed to have represented the sound [æ], which was a reflex of earlier Proto-Slavic */ē/, */oj/, or */aj/. That the sound represented by yat developed late in the history of Common Slavic is indicated by its role in the Slavic second palatalization of the Slavic velar consonants. Significantly, from the earliest texts, there was considerable confusion between the yat and the Cyrillic iotified a ⟨ꙗ⟩. One explanation is that the dialect of Thessaloniki (on which the Old Church Slavic literary language was based), and other South Slavic dialects shifted from /ě/ to /ja/ independently from the Northern and Western branches. The confusion was also possibly aggravated by the fact that Cyrillic Little Yus ⟨ѧ⟩ looks very similar to the older Glagolitic alphabet's yat ⟨ⱑ⟩. An extremely rare "iotated yat" form ⟨ꙓ⟩ also exists. In various modern Slavic languages, yat has reflexed into various vowels. For example, the old Slavic root běl (white) became bel /bʲel/ in Standard Russian (dialectal /bʲal/, /bʲijel/ or even /bʲil/ in some regions), bil /bʲil/ in Ukrainian, bjal in Bulgarian (bel in Western dialects), biel / biały in Polish, bílý in Czech and biely in Slovak. Older, unrelated reflexes of yat exist; for example, old word телѣгы (telěgi, carts) became modern Russian телеги (telegi) but in Serbian it is таљиге (taljige). Due to these reflexes, yat no longer represented an independent phoneme but an already existing one, represented by another Cyrillic letter. As a result, children had to memorize by rote whether or not to write yat. Therefore, the letter was dropped in a series of orthographic reforms: in Serbian with the reform of Vuk Karadžić, in Russian, Belarusian and Ukrainian roughly with the October revolution, and in Bulgarian and Rusyn as late as 1945. The letter is no longer used in the standard modern orthography of any of the Slavic languages written with the Cyrillic script, but survives in liturgical and church texts written in the Russian recension of Church Slavonic. It has, since 1991, found some favor in advertising. mlyako (milk) [n.] → mlekar (milkman); mlechen (milky), etc. syadam (sit) [vb.] → sedalka (seat); sedalishte (seat, e.g. of government), etc. svyat (world) [adj.] → svetoven (worldly); svetski (secular), etc. From the liberation of Bulgaria until 1945, the standard Bulgarian orthography did not reflect this alternation and used the Cyrillic letter yat for both "ya" and "e" in alternating roots. This was regarded as a way to maintain unity between Eastern and Western Bulgarians, as much of what was then seen as Western Bulgarian dialects was under foreign control. In 1947 the letter was removed from the Bulgarian alphabet and the spelling was changed to conform to the Eastern pronunciation. Pre-revolution typewriter with Yat on the bottom row, between Ч and С. 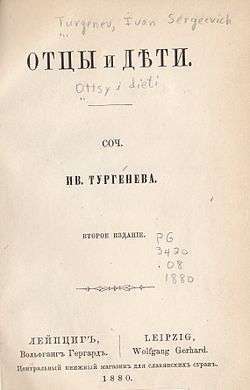 Cover of 1880 edition of Turgenev's Fathers and Sons, with yat in the title; in modern orthography, дѣти is spelled дети. In Russian, written confusion between the yat and 'е' appears in the earliest records; when exactly the distinction finally disappeared in speech is a topic of debate. Some scholars, for example W. K. Matthews, have placed the merger of the two sounds at the earliest historical phases (the 11th century or earlier), attributing its use until 1918 to Church Slavonic influence. Within Russia itself, however, a consensus has found its way into university textbooks of historical grammar (e.g., V. V. Ivanov), that, taking all the dialects into account, the sounds remained predominantly distinct until the 18th century, at least under stress, and are distinct to this day in some localities. Meanwhile, the yat in Ukrainian usually merged in sound with /i/ (see below), and therefore has remained distinct from ⟨е⟩. The story of the letter yat and its elimination from the Russian alphabet makes for an interesting footnote in Russian cultural history. See Reforms of Russian orthography for details. A full list of words that were written with the letter yat at the beginning of 20th century can be found in the Russian Wikipedia. A few inflections and common words were distinguished in spelling by е / ѣ (For example: ѣсть / есть [jesʲtʲ] "to eat" / "(there) is"; лѣчу / лечу [lʲɪˈɕu] "I heal" / "I fly"; синѣ́е / си́нее [sʲɪˈnʲe.jɪ], [ˈsʲi.nʲɪ.jɪ] "bluer" / "blue" (n.); вѣ́дѣніе / веде́ніе [ˈvʲe.dʲɪ.nʲjə], [vʲɪˈdʲe.nʲjə] "knowledge" / "leadership"). Its retention without discussion in the Petrine reform of the Russian alphabet of 1708 indicates that it then still marked a distinct sound in the Moscow koiné of the time. By the second half of the 18th century, however, the polymath Lomonosov (c. 1765) noted that the sound of ѣ was scarcely distinguishable from that of the letter е, and a century later (1878) the philologist Grot stated flatly in his standard Russian orthography (Русское правописаніе, Russkoje pravopisanije, [ˈru.skə.jə ˌpra.və.pʲɪˈsa.nʲjə]) that in the common language there was no difference whatsoever between their pronunciations. However, dialectal studies have shown that, in certain regional dialects, a degree of oral distinction is retained even today in syllables once denoted with ѣ. The spelling reform was finally promulgated by the Provisional Government in the summer of 1917. It appears not to have been taken seriously under the prevailing conditions, and two further decrees by the Soviet government in December 1917 and in 1918 were required. Orthography thus became an issue of politics, and the letter yat, a primary symbol. Émigré Russians generally adhered to the old spelling until after World War II; long and impassioned essays were written in its defense, as by Ilyin in c. 1952. Even in the Soviet Union, it is said that some printing shops continued to use the eliminated letters until their blocks of type were forcibly removed; certainly, the Academy of Sciences published its annals in the old orthography until approximately 1924, and the Russian Orthodox Church, when printing its calendar for 1922, for the first time in the new orthography, included a note that it was doing so as a condition of receiving a license for impression. To the builders of the new regime, conversely, the new spelling visibly denoted the shining world of the future, and marked on paper the break with the old. The large-scale campaign for literacy in the early years of the Soviet government was, of course, conducted in accordance with the new norms. In objective terms, the elimination of the yat, together with the other spelling reforms, decisively broke the influence of Church Slavonic on the living literary language. After the dissolution of the Soviet Union, as a tendency occasionally to mimic the past appeared in Russia, the old spelling became fashionable in some brand names and the like, as archaisms, specifically as "sensational spellings". For example, the name of the business newspaper Kommersant appears on its masthead with a word-final hard sign, which is superfluous in modern orthography: "Коммерсантъ". Calls for the reintroduction of the old spelling were heard, though not taken seriously, as supporters of the yat described it as "that most Russian of letters", and the "white swan" (бѣлый лебедь) of Russian spelling. In Ukrainian, yat has been traditionally represented /i/ or /ji/. In modern Ukrainian orthography its reflexes are represented by ⟨і⟩ or ⟨ї⟩. However, in some phonetic orthographies from the 19th century, it was used to represent /ʲe/ or /je/. This corresponds more with the Russian pronunciation of yat rather than actual word etymologies. The modern Ukrainian letter ⟨є⟩ has the same phonetic function. Several Ukrainian orthographies with the different ways of using yat and without yat co-existed in the same time during the 19th century, and most of them were discarded before the 20th century. After the middle of the 19th century Orthographies without yat dominated in the Eastern part of Ukraine and after the end of the 19th century they dominated in Galicia. However, in 1876–1905 the only officially legalized orthography in the Eastern Ukraine was based on Russian phonetic system (with yat for /je/) and in the Western Ukraine (mostly in Carpathian Ruthenia) orthography with yat for /i/ was used before 1945. 'New yat' is a reflex of /e/ (which merged with yat in Ukrainian) in closed syllables. New yat is not related to the Proto-Slavic yat, but it has frequently been represented by the same sign. Using yat instead of ⟨е⟩ in this position was a common after the 12th century. With the later phonological evolution of Ukrainian, both yat and new yat evolved into /i/ or /ji/. Some other sounds also evolved to the sound /i/ so that some Ukrainian texts from between the 17th and 19th centuries used the same letter (⟨и⟩ or yat) uniformly rather than variation between yat, new yat, ⟨и⟩, and reflex of ⟨о⟩ in closed syllables, but using yat to unify all i-sounded vowels was less common, and so 'new yat' usually means letter yat in the place of i-sounded ⟨е⟩ only. In some etymology-based orthography systems of the 19th century, yat was represented by ѣ and new yat was replaced with ⟨ê⟩ (⟨e⟩ with circumflex). At this same time, the Ukrainian writing system replaced yat and new yat by ⟨і⟩ or ⟨ї⟩. In Rusyn, yat was used until 1945 and removed under Soviet rule. Nowadays some Rusyn writers and poets try to reinstate it, but this initiative is not really popular among Rusyn intelligentsia. In the old Romanian Cyrillic alphabet, the yat, called eati, was used as the /ea/ diphthong. It disappeared when Romanian adopted the transitional alphabet, first in Wallachia, then in Moldova. The Old Serbo-Croatian yat phoneme is assumed to have a phonetic value articulatory between the vowels /i/ and /e/. In the Štokavian and Čakavian vowel systems, this phoneme lost a back vowel parallel; the tendency towards articulatory symmetry led to its merging with other phonemes. On the other hand, most Kajkavian dialects did have a back vowel parallel (a reflex of *ǫ and *l̥), and both the front and back vowels were retained in most of these dialects' vowel system before merging with a reflex of a vocalized Yer (*ь). Thus the Kajkavian vowel system has a symmetry between front and back closed vocalic phonemes: */ẹ/ (< */ě/, */ь/) and */ọ/ (< */ǫ/, */l̥/). Čakavian dialects utilized both possibilities of establishing symmetry of vowels by developing Ikavian and Ekavian reflexes, as well as "guarding the old yat" at northern borders (Buzet dialect). According to yat reflex Čakavian dialects are divided to Ikavian (mostly South Čakavian), Ekavian (North Čakavian) and mixed Ikavian-Ekavian (Middle Čakavian), in which mixed Ikavian-Ekavian reflex is conditioned by following phonemes according to the Jakubinskij's law (e.g. sled : sliditi < PSl. *slědъ : *slěditi; del : diliti < *dělъ : *děliti). Mixed Ikavian-Ekavian Čakavian dialects have been heavily influenced by analogy (influence of nominative form on oblique cases, infinitive on other verbal forms, word stem onto derivations etc.). The only exception among Čakavian dialects is Lastovo island and the village of Janjina, with Jekavian reflex of yat. The most complex development of yat has occurred in Štokavian, namely Ijekavian Štokavian dialects which are used as a dialectal basis for modern standard Serbo-Croatian variants, and that makes the reflexes of yat one of the central issues of Serbo-Croatian orthoepy and orthography. In most Croatian Štokavian dialects yat has yielded diphthongal sequence of /ie̯/ in long and short syllables. The position of this diphthong is equally unstable as that of closed */ẹ/, which has led to its dephonologization. Short diphthong has thus turned to diphonemic sequence /je/, and long to disyllabic (triphonemic) /ije/, but that outcome is not the only one in Štokavian dialects, so the pronunciation of long yat in Neo-Štokavian dialects can be both monosyllabic (diphthongal or triphthongal) and disyllabic (triphonemic). However, that process has been completed in dialects which serve as a dialectal basis for the orthographical codification of Ijekavian Serbo-Croatian. In writing, the diphthong /ie̯/ is represented by the trigraph ije – this particular inconsistency being a remnant of the late 19th century codification efforts, which planned to redesign common standard language for Croats and Serbs. This culminated in the Novi Sad agreement and "common" orthography and dictionary. Digraphic spelling of a diphthong as i.e. was used by some 19th-century Croat writers who promoted so-called "etymological orthography" – in fact morpho-phonemic orthography which was advocated by some Croatian philological schools of the time (Zagreb philological school), and which was even official during the brief period of Independent State of Croatia (1941–45). In standard Croatian, although standard orthography is ije for long jat, standard pronunciation is je: Serbian has two standards: Ijekavian is ije for long jat and Ekavian which uses e for short, and e: for long jat. Standard Bosnian and Montenegrin use je for short, and ije for long jat. Dephonologization of diphthongal yat reflex could also be caused by assimilation within diphthong /ie̯/ itself: if the first part of a diphthong assimilates secondary part, so-called secondary Ikavian reflex develops; and if the second part of a diphthong assimilates the first part secondary Ekavian reflex develops. Most Štokavian Ikavian dialects of Serbo-Croatian are exactly such – secondary Ikavian dialects, and from Ekavian dialects secondary are the Štokavian Ekavian dialects of Slavonian Podravina and most of Serbia. They have a common origin with Ijekavian Štokavian dialects in a sense of developing yat reflex as diphthongal reflex. Some dialects also "guard" older yat sound, and some reflexes are probably direct from yat. Direct Ikavian, Ekavian and mixed reflexes of yat in Čakavian dialects are a much older phenomenon, which has some traces in written monuments and is estimated to have been completed in the 13th century. The practice of using old yat phoneme in Glagolitic and Bosnian Cyrillic writings in which Serbo-Croatian was written in the centuries that followed was a consequence of conservative scribe tradition. 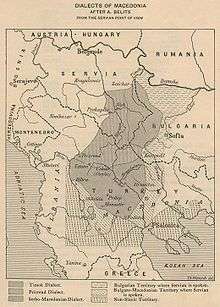 Croatian linguists also speak of two Štokavians, western Štokavian (also called Šćakavian) which retained yat longer, and eastern Štokavian which "lost" yat sooner, probably under (western) Bulgarian influences. Areas which bordered Kajkavian dialects mostly retained yat, areas which bordered Čakavian dialects mostly had secondary Ikavisation, and areas which bordered (western) Bulgarian dialects mostly had secondary Ekavisation. "Core" areas remained (i)jekavian, although western part of the "core" became monosyllabic for old long yat. Reflexes of yat in Ijekavian dialects are from the very start dependent on syllable quantity. As it has already been said, standard Ijekavian Serbo-Croatian writes trigraph ije at the place of old long yat, which is in standard pronunciation manifested disyllabically (within Croatian standard monosyllabic pronunciation), and writes je at the place of short yat. E.g. bijȇl < PSl. *bělъ, mlijéko < *mlěko < by liquid metathesis from *melkò, brijȇg < *brěgъ < by liquid metathesis from *bȇrgъ, but mjȅsto < *mě̀sto, vjȅra < *vě̀ra, mjȅra < *mě̀ra. There are however some limitations; in front of /j/ and /o/ (< word-final /l/) yat has a reflex of short /i/. In scenarios when /l/ is not substituted by /o/, i.e. not word-finally (which is a common Štokavian isogloss), yat reflex is also different. E.g. grijati < *grějati, sijati < *sějati, bijaše < *bějaše; but htio : htjela < *htělъ : *htěla, letio : letjela (< *letělъ : *letěla). The standard language also allows some doublets to coexist, e.g. cȉo and cijȇl < *cě̑lъ, bȉo and bijȇl < *bě́lъ. Short yat has reflexes of /e/ and /je/ behind /r/ in consonant clusters, e.g. brȅgovi and brjȅgovi, grehòta and grjehòta, strèlica and strjèlica, etc. If short syllable with yat in the word stem lengthens due to the phonetic or morphological conditions, reflex of /je/ is preserved, e.g. djȅlo – djȇlā, nèdjelja – nȅdjēljā. In modern standard Ijekavian Serbo-Croatian varieties syllables that carry yat reflexes are recognized by alternations in various inflected forms of the same word or in different words derived from the same stem. These alternating sequences ije/je, ije/e, ije/i, ije/Ø, je/i, je/ije, e/ije, e/je, i/ije are dependent on syllable quantity. Beside modern reflexes they also encompass apophonic alternations inherited from Proto-Slavic and Indo-European times, which were also conditioned by quantitative alternations of root syllable, e.g. ùmrijēti – ȕmrēm, lȉti – lijévati etc. These alternations also show the difference between the diphthongal syllables with Ijekavian reflex of yat and syllables with primary phonemic sequence of ije, which has nothing to do with yat and which never shows alternation in inflected forms, e.g. zmìje, nijèdan, òrijent etc. ↑ Младенов, Стефан. Български етимологичен речник. ↑ Успенский, Лев: Слово о словах. Лениздат 1962. p. 148. ↑ "Декрет о введении нового правописания (Decree on introduction of new orthography)". Известия В.Ц.И.К. 13 October 1918, #223 (487) (in Russian). 1917. Retrieved 2009-03-15. Barić, Eugenija; Mijo Lončarić; Dragica Malić; Slavko Pavešić; Mirko Peti; Vesna Zečević; Marija Znika (1997). Hrvatska gramatika. Školska knjiga. ISBN 953-0-40010-1.